For more than 25 years, NAfME member Albert Bouchard has been working as an administrator and teaching music at Edward A. Reynolds West Side High School, a Title I school in New York. Now, on May 3, Albert Bouchard will be honored as one of the “Great Educators” in a White House ceremony taking place on National Teacher Appreciation Day. 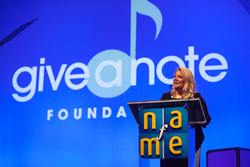 Give a Note Foundation Board Chair/President Beth Slusher announces schools that received grants from 21st Century Fox and Give a Note Foundation. What does a successful rock band member do after retiring from performing and touring? In Albert Bouchard’s case, he enters the classroom to bring music into the lives of students who might not otherwise experience it. What might seem like a challenging transition was a natural move for Mr. Bouchard. For more than 25 years, Albert Bouchard, a member of the National Association for Music Education (NAfME), has been working as an administrator and teaching music at Edward A. Reynolds West Side High School, a Title I school in the Morningside Heights section of Manhattan, NY. Last fall in collaboration with 21st Century Fox, the Give a Note Foundation presented Reynolds West Side High School a $3,000 grant for their exemplary music program. Mr. Bouchard mostly funds this program out of his own pocket. He understands the significant difference music makes in the lives of students—and many students at Reynolds West Side High School are there to make a fresh start in their education. Mr. Bouchard helps ensure they get a strong start on life. Now, on May 3, along with many other educators from around the nation, Albert Bouchard will be honored as one of the “Great Educators” in a White House ceremony taking place on National Teacher Appreciation Day. Albert Bouchard knows that all students need more than “more cowbell”—they need a high-quality, classroom music education where they can express themselves and launch successfully into life. NAfME celebrates this great honor bestowed upon him by the White House. For additional information, contact Catherina Hurlburt at catherinah(at)nafme(dot)org or 703-860-4000, ext. 242.